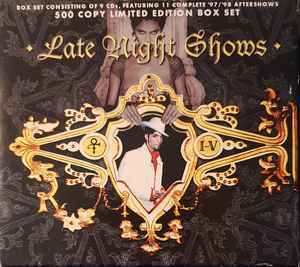 Late Night Shows was initially planned as series [1997/98 Aftershow Series] but then released as 9 disc set in 5 jewel cases (4 x slim 2-Disc and 1 x standard jewel cases) without the box. However, later,in the summer of the same year, Sabotage distributed a limited/numbered box (limited/numbered) to customers & subscribers who previously purchased the set. In a later issued Sabotage catalog (from 2017) they offered occasional residual original volumes and for completists also the other volumes but in CD-R format. Volume 2: Track 4-8 is listed as 'Instrumental' / The tracks 4-11 (listed as 'Unknown Track) & 4-12 belong to the end of the Church performance (disc 3) but that's not comprehensible on the artwork.